Protect your confidential and valuable information from being stolen by shredding any documents that may put your business at risk from identity fraud. The Rexel Mercury RSS2232 small office shredder is an ideal space saving desk side model and has a P-2 security level which shreds paper into Strip Cut particles (sized 5.8mm), making it ideal for everyday shredding. Paper jams in a shredder are time consuming, frustrating, messy and sometimes costly. With the RSS2232 shredder, paper jams are a thing of the past. Featuring the revolutionary Mercury jam free technology, the RSS2232 has a unique brightly lit LED indicator that warns you whether you are trying to feed too much paper into the shredder in one go. The red light means there is too much paper and a green light means that there is no risk of jamming. The RSS2232 is an ultra quiet, general use shredder that can shred up to 23 sheets of 70gsm paper in a continuous single feed as well as CD’s, credit cards, paperclips and staples. Specifically designed for regular shredding, it features a 32 litre large capacity waste bin that holds up to 250 sheets of paper. The front opening waste bin enables simple and mess free emptying and the shredder cuts off automatically when the bin is full. The RSS2232 goes into power saving mode after 2 minutes of non use, making it an ideal choice for the environmentally friendly office. Optional 32 litre paper waste sacks are available to encourage recycling of the shredded paper. With a clear, easy to use control panel and a CD tray to separate out waste for recycling, the stylish RSS2232 is a practical choice for a busy office worker who requires a smart, space saving shredder by their desk side. Weighing 16.08kg and sized at 584(H) x 270(W) x 535(D)mm, the RSS2232 comes with the extra peace of mind of a 2 year warranty, an extended 10 year warranty on the cutters plus it is compliant with finger safe international standards and is TUV and CE compliant. The Rexel RSS2232 provides strip (ribbon) cut security for quick basic security levels. Each sheet is cut into 40 strips, meaning customers can protect their sensitive information easily and without jams. 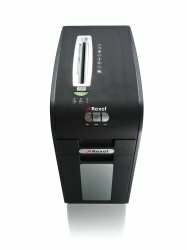 This shredder features Mercury Jam-Free technology, allowing customers to shred with confidence.Shredding up to 23 sheets (70 gsm) or 22 sheets (80 gsm) in one pass, the Rexel RSS2232 is perfect for the shredding needs of any office users with a requirement for basic security. Shredding up to 23 sheets (70 gsm) or 22 sheets (80 gsm) in one pass, the Rexel RSS2232 is perfect for the shredding needs of any office users with a requirement for basic security. The RSS2232 will quickly shred every A4 sheet of paper into 40 strip-cut pieces to ensure that your physical confidential information is secure. A large 32L bin holds up to 250 sheets of strip cut paper, ensuring that worrying about empying the shredder will be a thing of the past. With the ability to securely shred CDs and credit cards, the Rexel RSS2232 can handle all aspects of your data security. The shredder is also able to take paperclips and staples in its stride, meaning that customers needn't lose any time in destroying their confidential information.